Naples – January 2014. TRH Prince Charles and Princess Camilla of Bourbon Two Sicilies, Duke and Duchess of Castro, together with other senior members of the Neapolitan Royal Family attended the Beatification of Maria Cristina of Savoy. Queen Maria Cristina of the Two Sicilies, born in 1812 was the daughter of King Victor Emmanuel I of Sardinia and Archduchess Maria Teresa of Austria-Este, Maria Cristina married King Ferdinand II of the Two Sicilies in 1832. The Queen died aged 24 in 1836 following the birth of their only child who later became the last reigning King of the Two Sicilies, Francis II. 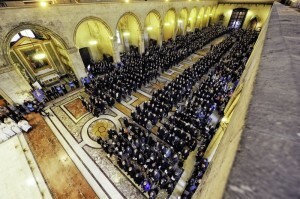 The Pontifical event took place at the historic Basilica of Santa Chiara in the heart of the Naples, the historic capital city of the former Kingdom of the Two Sicilies. Several thousands of people attending this moving event which united for the first time in 50 years the principal branches of the Bourbon Two Sicilies dynasty lead by HRH The Duke of Castro in Italy and HRH The Duke of Calabria in Spain. The Holy Father, Pope Francis who approved the beatification on 2 May 2013, was represented at the mass by HE Angelo Cardinal Amato, Prefect of the Congregation for the Causes of Saints. 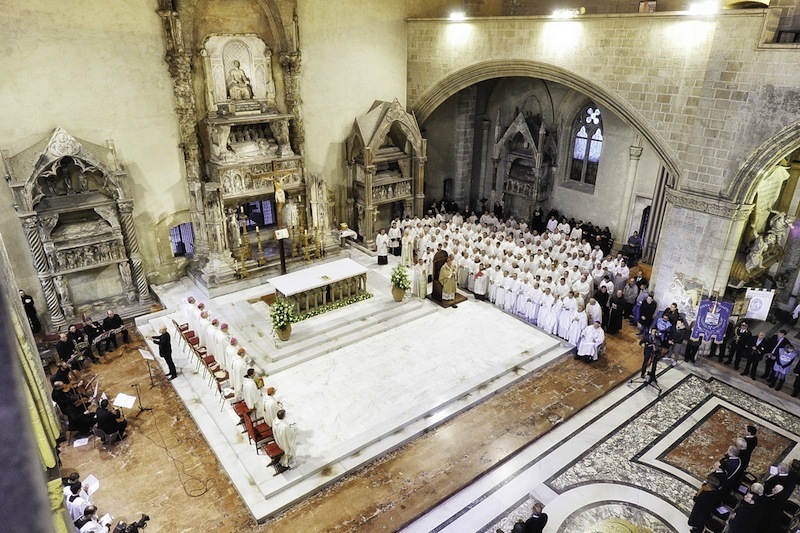 HE Crescenzio Cardinal Sepe, Archbishop of Naples was celebrant and HE Renato Raffaele Cardinal Martino, Grand Prior of the Sacred Military Constantinian Order of St George was also present. 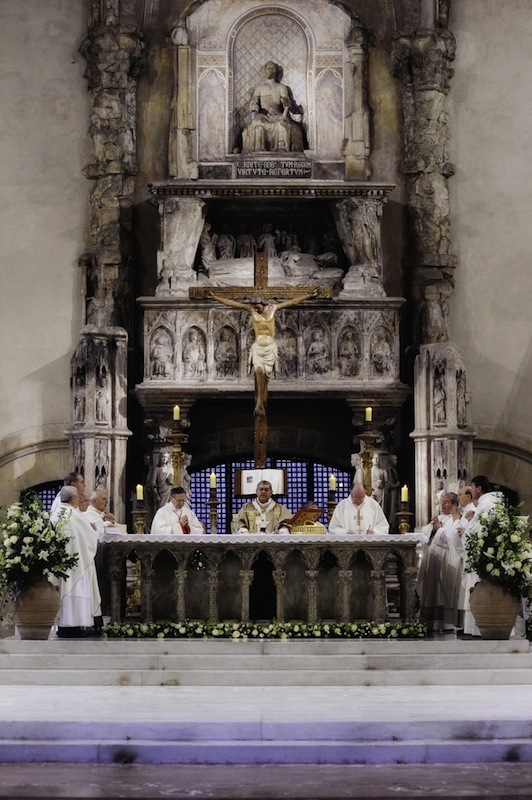 In his homily at the Mass of beatification, Cardinal Amato outlined the reasons for the beatification – the Queen’s innocence, modesty, and mortification with respect to food and entertainment, as well as her love for the poor and sick. All Christians, the prelate emphasised, are given opportunities to become holy, whatever their state of life. TRH The Duke and Duchess of Castro and TRH Prince Pedro and Princess Sofia of Bourbon Two Sicilies, Duke and Duchess of Noto, attended together the Beatification with other senior members of the Bourbon Two Sicilies Family including HRH Princess Ana of Bourbon Two Sicilies, Duchess of Calabria, HRH Prince Jaime of Bourbon Two Sicilies, Duke of Capua, HRH Princess Maria Carolina of Bourbon Two Sicilies, Duchess of Palermo, HRH Princess Maria Chiara of Bourbon Two Sicilies, Duchess of Capri, HRH Princess Beatrice of Bourbon Two Sicilies, TRH Prince and Princess Casimiro of Bourbon Two Sicilies TI & RH Archduke and Archduchess Simeon of Austria, HI & RH Archduke Martin of Austria, HRH Princess Ines de Borbon Dos Sicilias de Carelli Palombi, HRH Prince Luigi Alfonso of Bourbon Two Sicilies and the Rev Alessandro di Borbone-Due Sicilie, HRH Princess Caroline of Bourbon Two Sicilies and HRH Princess Maria Annunziata of Bourbon Two Sicilies. Among members of other European Families present were HRH The Duke of Braganza, HRH Princess Clotide Princess of Venice and Piedmont, HRH Princess Maria Gabriella of Savoy, TRH The Duke and Duchess of Aosta, HRH Prince Serge of Yugoslavia and HSH Princess Marie-Therese von Hohenberg Mrs Anthony Bailey. The senior representatives from both the Italian and Spanish branches of the Constantinian Order were also present. 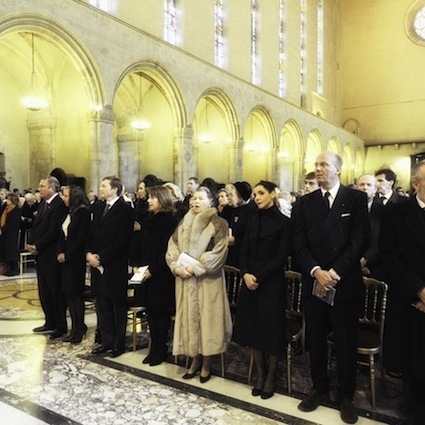 Following the beatification ceremony the Duke and Duchess of Castro and uke and duchess of noto together with other senior members of the Bourbon Two Sicilies dynasty paid homage at the tomb of the Blessed Queen Maria Cristina situated within the Royal Chapel within the Basilica situated close to the main altar which bears the remains of the Neapolitan monarchs and other members Bourbon Two Sicilies dynasty. HRH The Duchess of Castro offered the flower decorations throughout the Basilica of Santa Chiara. Pink and white roses, wallflowers, lisianthus and lilies, carnations and green and white daisies were artistically arranged around the sanctuary and the tomb of the Blessed in the Chapel of the Royal Burial by the expert hands of the Ladies of the Garden Club of Caserta. Their Royal Highnesses further supported the Basilica by the erection of eight large flat screens set up along the aisle of the immense Basilica of Santa Chiara which allowed the entire ceremony, filmed by three cameras, to be viewed by the faithful who filled what is one of the largest Gothic building in Europe. The principal guests also attended a reception held in the cloisters of the Bascilia and the Duke and Duchess greeted many of their supporters who had gathered at the Basilica for this truly historic day. To download a list of the principal guests click here. To download the text of the Homily of HE Crescenzio Cardinal Sepe click here.